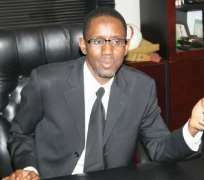 The warrant of arrest issued by the Code of Conduct Tribunal on the former Chairman of the Economic and Financial Crimes Commission (EFCC), Mallam Nuhu Ribadu, may have been halted as a Federal High Court in Abuja has ordered that the tribunal should be served with the processes challenging the arrest warrant. The court, which adjourned sitting on the matter till January 13, also summoned the Inspector General of Police (IG) whom Ribadu through his counsel, Mr. Femi Falana, said had told Interpol to arrest him anywhere in the world. The development is coming as the tribunal Chairman, Justice Constance Momoh, who issued the arrest warrant refused to grant an application by Ribadu's counsel, Falana, asking her to vacate the order. Ribadu is being tried at the Code of Conduct Tribunal over charges filed by the Code of Conduct Bureau that he allegedly failed to declare his assets as required by the Public Officers Code of Conduct Laws of Nigeria. The tribunal issued an arrest warrant on the former EFCC boss for failing to appear before it after about two adjournments. Justice Garba Mohammed Umar, while giving the order on the service of processes, noted that the essence was for the tribunal to come and show cause why it could not grant an injunctive order restraining the IG from executing the arrest warrant against Ribadu pending the hearing and determination of the motion before the court. Justice Umar also wants the tribunal to convince the court on why it could not be restrained from further hearing of the case of the Attorney General of the Federation vs. Ribadu in charge No: FCT/ABJ01/09 pending the hearing and final determination of the motion on notice herein. “An order of interim injunction restraining the 1st respondent from further hearing the case of Attorney General Vs. Nuhu Ribadu in charge No: FCT/ABJ/01/09 pending the hearing and final determination of the motion on notice herein.” The supporting affidavit noted that on “September 10, 2009, Ribadu paid a condolence visit to the family of Chief Gani Fawehinmi (SAN) in Lagos and was at the Lagos University Teaching Hospital, Ikeja to pray for the soul of the deceased. “The 2nd respondent, IGP who publicly denied that the applicant visited Nigeria turned round to set up a committee to investigate the visit which was quoted in the Punch Newspapers of September 30, 2009.” He added that though the applicant did not commit any offence known to law, the Federal Government declared a manhunt for him and he had to rush out of the country for safety. Meanwhile, explaining to the tribunal yesterday why Ribadu who was supposed to appear before the tribunal today had not appeared as ordered, Falana said he had not been able to renew his international passport. He however expressed optimism that his international passport would be renewed in a week's time.